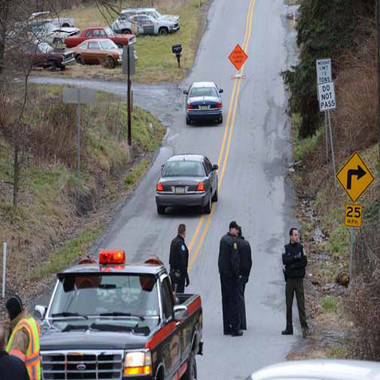 Authorities block the road along Route 22 near Canoe Creek State Park, Pa., while investigating the shootings Friday, Dec. 21,2012. A gunman killed three people Friday in central Pennsylvania, including a woman in a church, before police shot him dead, authorities said. Three state troopers were injured, including one who was shot twice in the chest but survived thanks to his bulletproof vest. Pennsylvania State Police said the man killed the three people at three different locations, including the church and a private home in Frankstown Township, about 75 miles west of Harrisburg. About 9 a.m. ET, the gunman fired into the church, killing the woman, before shooting and killing a man at a private residence, police said. Those shootings may have been related, Blair County District Attorney Richard Consiglio said. As the gunman fled, his pickup truck crashed into a second vehicle, and he shot and killed the other driver, police said. The truck subsequently crashed into a car driven by one of the troopers on Juniata Valley Road near Geeseytown, and the gunman got out and began firing. The troopers returned fire, killing the suspect, police said. The woman was killed at Juniata Valley Gospel Church in Frankstown Township, the Rev. James McCaulley, brother of the church's late pastor, told The Associated Press. McCaulley, who was in town after having presided over his brother's funeral Thursday, told the AP that the woman was struck by gunshots that flew through a window of the church hall as she was decorating for a children's Christmas party. Consiglio said one of the injured troopers was shot twice in the chest but was saved by his bulletproof vest. One was injured in the crash, and one was injured by flying glass from a bullet that was shot through his car window, he said. None sustained life-threatening injuries. The county sheriff's office indicated that the gunman may have had more targets in mind, saying in a post on its Facebook page that the toll "could have been a lot worse" had state troopers not responded as quickly as they did. As it was, investigators' resources were stretched processing five separate crime scenes, including the church, said Deputy Col. George Bivens of the State Police. "This is one of the largest crime investigations that I've seen," Consiglio said. The Blair County Emergency Management Agency said it was calling in counselors for the public to a command center it had set up at the Geeseytown Fire Hall, and a prayer service and vigil were planned for Saturday at Geeseytown Lutheran Church. Michelle Acevedo of NBC News contributed to this report.